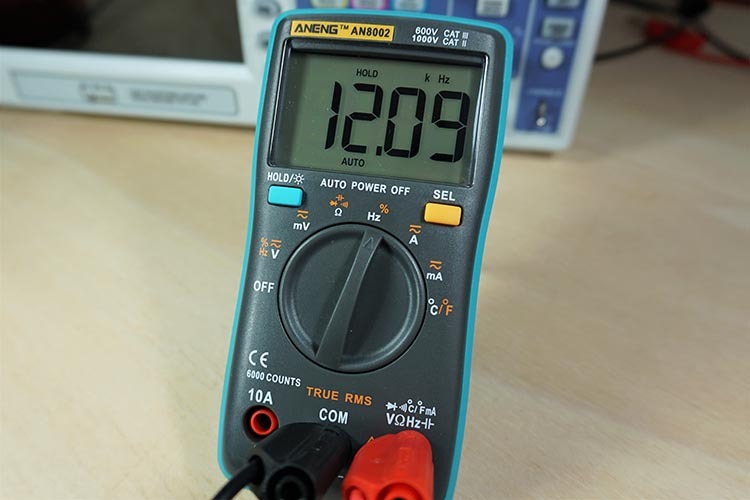 In this article we’re going to take a look at the ANENG AN8002 digital multimeter. 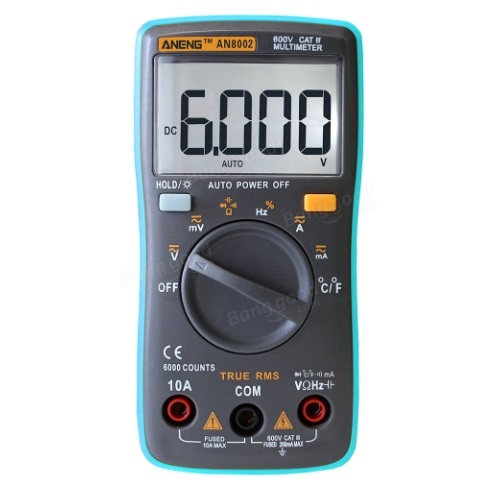 The ANENG AN8002 is a low cost autorange multimeter with great specifications when compared with multimeters within its price range. 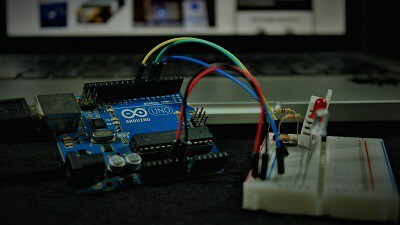 It costs less than $20, and besides the standard measurements, it also measures frequency, duty cycle, and temperature. 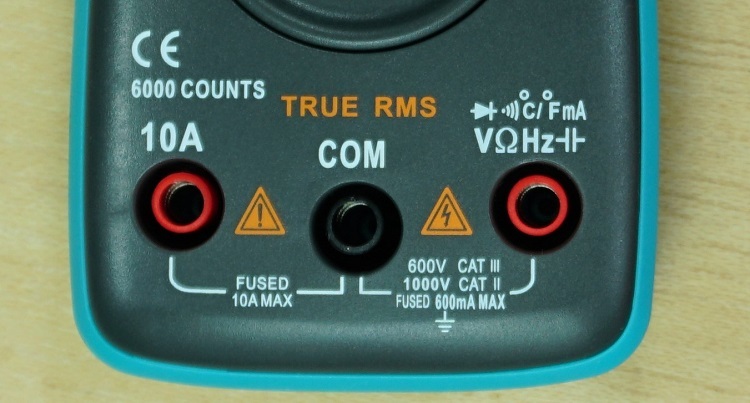 Additionally, it features true RMS AC measurement, 6000 counts, and many other cool features. 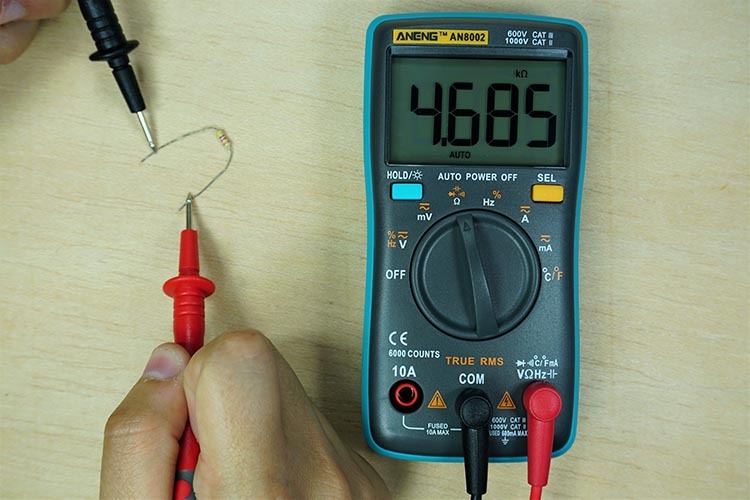 Continue reading for a more in depth analysis of the ANENG AN8002 multimeter. The ANENG AN8002 is available in many stores (see the comparison table below). Its price varies, but you can get it for approximately $20 in most stores. 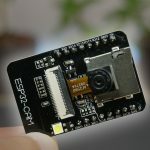 It only costs $12.99 on Banggood. Tip: if you need a multimeter that reads current in the μA range, we recommend the ANENG AN8008 Digital Multimeter. 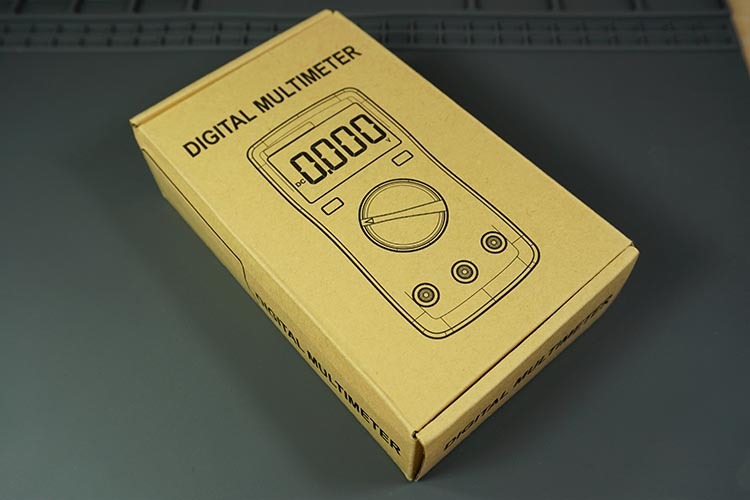 The multimeter came in a small cardboard box as shown in the figure below. 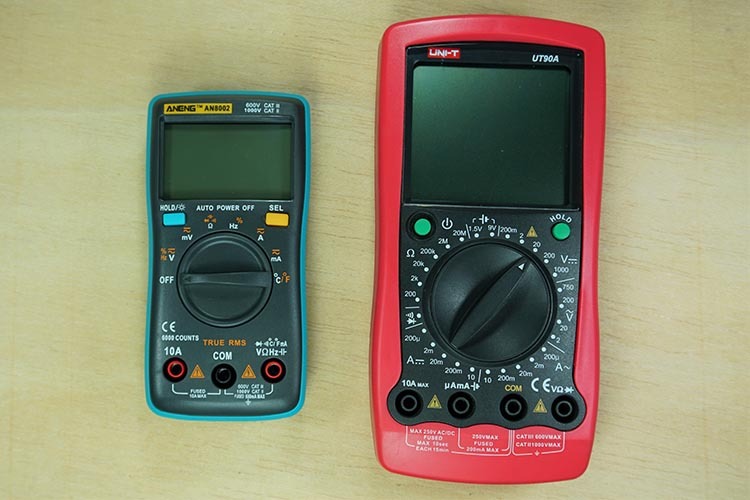 We’ve got our multimeter from Banggood, but you should receive an identical package regardless of the store. 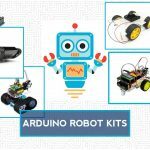 Inside the package you’ll find the multimeter itself, a pair of probes, a thermocouple probe, and a small bag to carry and store your meter. It also comes with a manual written in english (we didn’t include it in the photo). The probes seem really good, and come with protection caps on both ends. The thermocouple probe doesn’t have a good finish, but it does the job. When it comes to the multimeter, it feels very sturdy and is covered in a hard plastic. It doesn’t have a rubber holster as most multimeters do. It has a very thin stand at the back if you need to tilt your meter. However, because the stand is so thin and it doesn’t have rubber feet, it will bend and slide around easily. 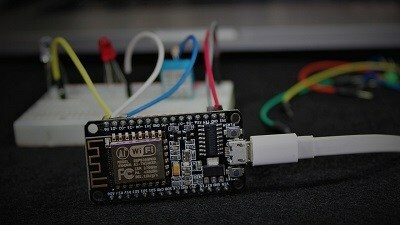 However, because it is so small when compared with regular meters, you can easily carry it around in your hand. This is also a great option if you’re short on space on your desk. For means of comparison, here’s a photo side by side with our regular meter. 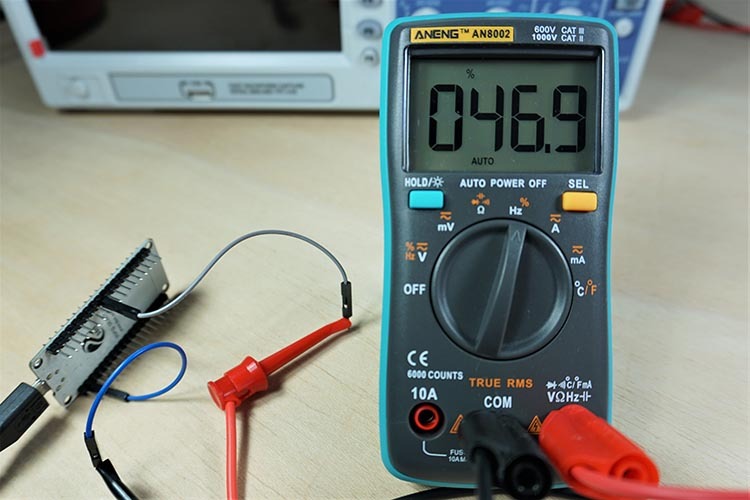 When it comes to the ANENG AN8002 features and specs, they are very good for a $12 multimeter. 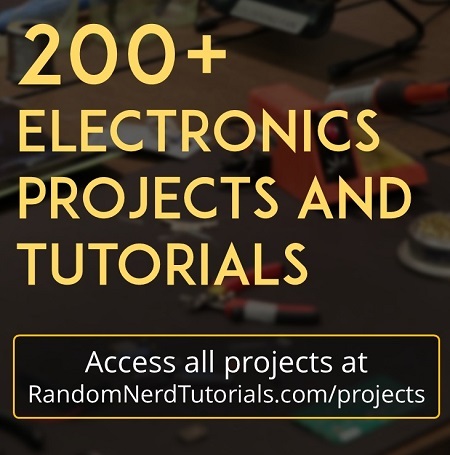 This is a 6000 counts (for this price you usually get 2000 counts) multimeter with true RMS (a feature that you’ll find only in more expensive meters). 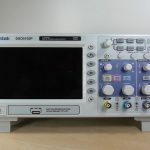 Additionally, besides measuring the most basic measurements like voltage, resistance, and current, it also measures frequency, duty cycle, capacitors, and temperature. 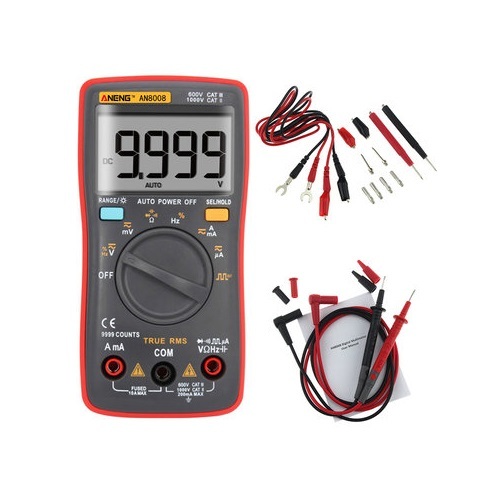 You’ll hardly find temperature measurement in a multimeter within this price range. It also comes with other nice features like data hold, and backlight. The display is very wide for such a small meter and the contrast between the background and the numbers is really good (way better than our other meter). So, you won’t have any issues reading the measurements from any angle, whether it’s in a dark or in a well lit environment. Another good feature is the auto power off function. The meter emits a beep sound after a few minutes of inactivaty, and then it automatically turns off. This is great to make the batteries last longer. This meters runs on 2x AAA batteries (not included in the package). Using the ANENG AN8002 is very intuitive. This is an autorange meter, so it is more practical than our other meter. You just have to turn the knob to the measurement you want to take. The “SEL” button allows you to change between measurements within the same section. If you press the “HOLD” button, it holds the measurement, which is practical if you want to take notes. 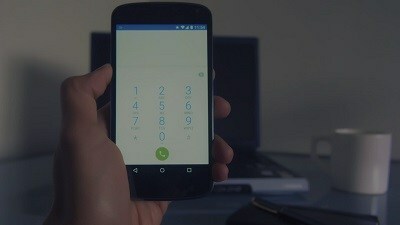 You can hold the “HOLD” button to turn the back light on. 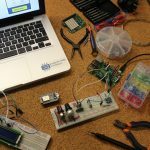 We had no issues measuring voltage, current, resistance, or capacitance. These measurements seemed to be pretty accurate for a $12 meter. The photo below shows measuring a 4.7KOhm +/- 5% resistor. This meter also works pretty good checking continuity and measuring the duty cycle. 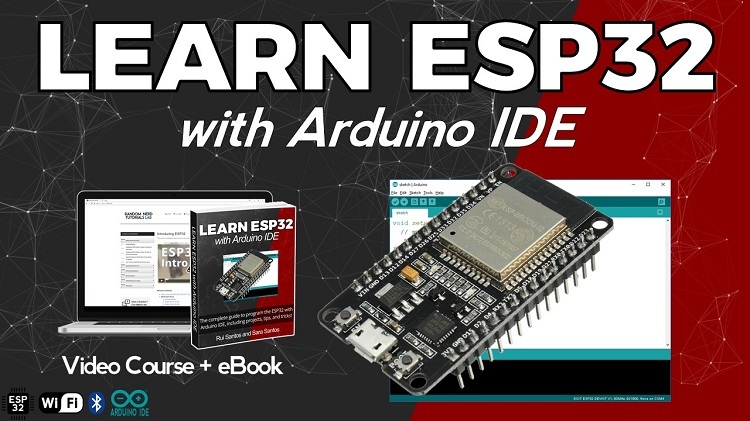 The figure below shows measuring the duty cycle of a PWM signal from the ESP32. The duty cycle set on the code was 47%. The meter is measuring 46.9%, which is really good. 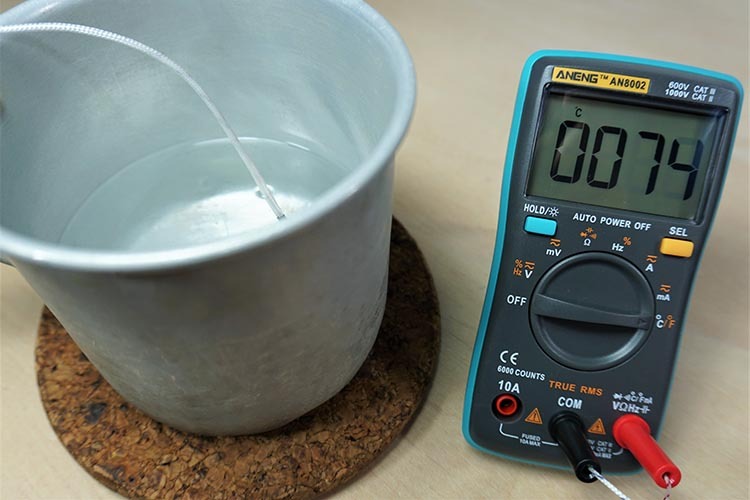 To measure the temperature, you need to switch to the thermocouple probe. In the figure below we’re measuring hot water (a few minutes after boiling). We also tested the temperature on different things to try to understand how accurate the meter is. However, we don’t have a calibrated temperature measurement tool, so we can’t really tell how accurate the meter is. But, in our opinion it does give an approximate value of the actual temperature (maybe 2 or 3 degrees off). The figure below shows the temperature in Celsius, but you can press the “SEL” button to show the temperature in Fahrenheit. Some disadvantages of this meter: it doesn’t come with the μA range neither a manual ranging button. 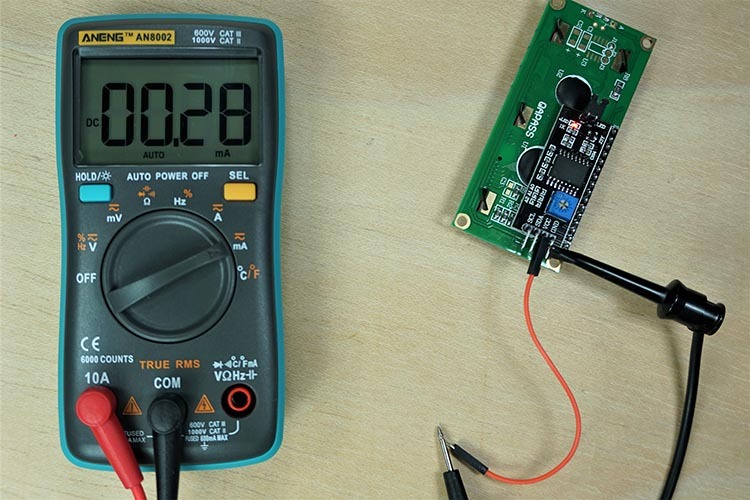 We haven’t tested the multimeter’s features when it comes to AC measurements (we rarely use AC in our projects). 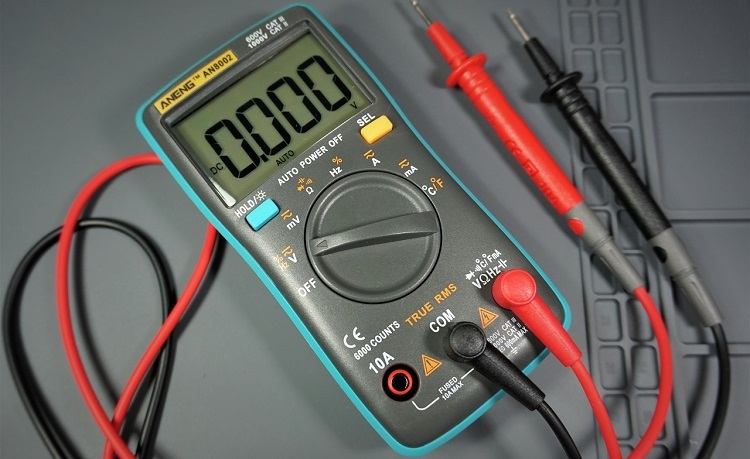 But, we’ve watched and read several reviews saying that the multimeter also performs quite well measuring AC voltage and current. Additionally, they say that the multimeter does have true RMS as advertised. The safety rating of this meter claims to be 600V CAT III and 1000V CAT II. However, we doubt that these cheap multimeters are independently tested. So, we wouldn’t trust this protection rating. Note: we’ve read/watched teardown reviews for this multimeter, and this multimeter’s circuit doesn’t have protection for the advertised protection rate. 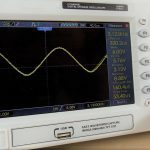 Is the ANENG AN8002 Multimeter Any Good? Yes, absolutely! For just $12 this multimeter is great. You won’t find true RMS, 6000 counts meter within this price range. Additionally, it comes with many useful features and measurements that most meters under $20 don’t have, like temperature, frequency, and duty cycle measurements. 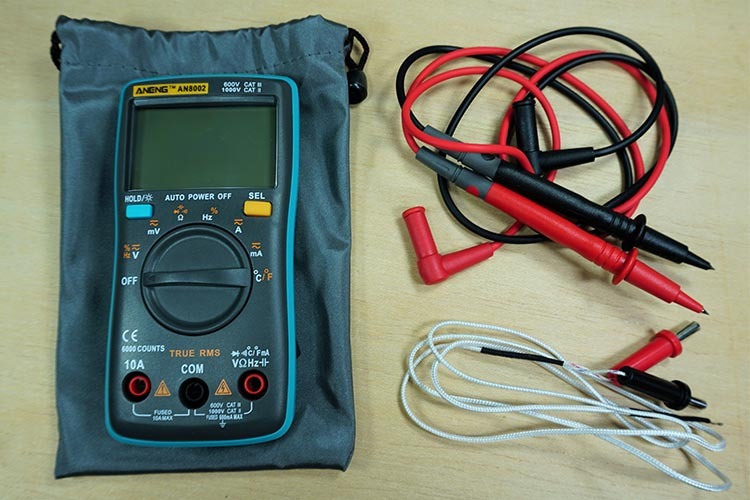 We truly recommend this multimeter for electronics bench work. If you’re an electronics hobbyist, and use the multimeter in low voltages and low current scenarios this multimeter will surely meet most of your needs. In our work, we don’t need to deal with high voltages neither high current. So, this meter is good enough for most of our projects. Note: if you’re a professional electrician that deals a lot with high AC voltages and/or a lot of current, we don’t recommend this meter. You need a high-end multimeter. As we’ve mentioned previously, the meter doesn’t come with μA range. This can be really annoying when trying to take very small current measurements. However, there are other models of this meter but with μA range – the ANENG AN8008. The ANENG AN8008 doesn’t measure temperature, it is a 9999 count meter, and it has an option to output a square wave signal. It costs $3 more than the ANENG AN8002, but if you don’t need temperature measurement, the ANENG AN8008 is preferable over the AN8002. The ANENG AN8008 has almost 1000 reviews on Banggood, in which 97% are 5-star reviews. We’re featuring the product on Banggood because it is where you can find the lowest price (at the time of this review). But you can also get the multimeter from other stores like Amazon.